Published: Feb. 20, 2014 at 01:04 p.m. Updated: Feb. 20, 2014 at 02:31 p.m. In advance of the 2014 NFL Draft, Bucky Brooks is examining the best team fits for one high-profile prospect each week. Today, he takes on Central Florida quarterback Blake Bortles. 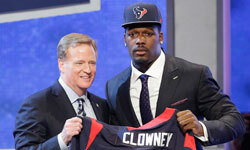 Past installments cover Jadeveon Clowney and Sammy Watkins. It's not a coincidence that championship-caliber NFL teams tend to have a franchise quarterback on the roster. As the only offensive skill player to touch the ball on every snap, the quarterback ultimately has the biggest hand in deciding the outcome of games. He must show the elite physical ability and mental acumen to win at the highest level, whether that means connecting on the drive-sustaining throw from the pocket on third-and-long or making a clever audible at the line to combat a blitz. While it's often easy to see which NFL quarterbacks have the necessary traits to capture a title, it's much harder to identify those players at the collegiate level. The proliferation of the spread offense and its "pick and stick" concepts (one-read progressions) makes it tough to fully assess a young quarterback's talent and long-term pro potential. Thus, scouts have a tendency to fall in love with quarterbacks who flash extraordinary talent, production and playmaking ability in three- or four-game stretches. Looking at the 2014 draft class, the quarterback who seems to be benefitting the most from this type of "flash" evaluation is Central Florida's Blake Bortles. The 6-foot-5, 240-pound signal-caller produced his second straight 3,000-yard season as a junior in 2013, with notable wins over Penn State and Louisville marking UCF's path to its first appearance (and victory) in a BCS bowl game in school history. From a scouting perspective, Bortles looks like a prototypical franchise quarterback. He has impressive physical dimensions, arm talent and athleticism. He operates comfortably from the pocket, but he also has the mobility and improvisational ability to play in a sandlot manner. Bortles' combination of skills reminds me of a young Ben Roethlisberger -- and that's nothing to scoff at, considering Big Ben has lifted the Pittsburgh Steelers to three Super Bowls (and two titles) in 10 seasons. Now, I must admit that I've recently voiced some concerns about Bortles' game. He remains a work in progress at the position and isn't quite ready to make an immediate impact as a pro. However, I believe his combination of size, arm talent and athleticism could allow him to shine in the right system down the road. If given the time to hone his craft on the practice field, away from the critical eyes of observers expecting a transcendent superstar, Bortles could emerge as a true franchise player in a few years. Which teams are the ideal fit for the signal-caller? I've come up with five that make sense. Note: The squads listed below are those that would best utilize Bortles' talents, regardless of the likelihood that they'll be able to acquire the quarterback. Matt Schaub has been with the Texans for the past seven seasons, earning a pair of Pro Bowl berths during that time. Yet, most observers around the league believe Schaub lacks the "it" factor needed to take Houston to the Super Bowl, and the Texans are expected to part ways with the veteran this offseason. Thus, new coach Bill O'Brien needs to identify a young quarterback with the potential to help his squad reach the next level. Bortles certainly possesses the size, arm talent and pocket passing skills that O'Brien apparently prefers in his quarterbacks, judging by the similarities between Bortles and the signal-callers O'Brien worked with while serving on the New England Patriots' staff (Tom Brady) and as head coach at Penn State (Christian Hackenberg). Of course, Bortles also offers more athleticism and mobility than any quarterback O'Brien has coached in the past. With Bortles, the Texans could utilize the traditional drop-back and play-action passing game while also incorporating some movement-based concepts to take advantage of his skills as a dual-threat playmaker. Houston already has what would be a stellar supporting cast in place, featuring Andre Johnson, DeAndre Hopkins, Owen Daniels and Arian Foster. Adding an athletic quarterback like Bortles would give one of the NFL's most explosive offenses an extra dimension -- and, most importantly, it could make the unit nearly impossible to defend, regardless of Bortles' rookie status. The lack of a franchise quarterback has kept the Browns from gaining ground on their AFC North rivals. New coach Mike Pettine certainly recognizes the need to identify such a quarterback, which is why he lured Kyle Shanahan to Cleveland to be his offensive coordinator. The 34-year-old play-caller has a strong reputation for developing signal-callers, with Robert Griffin III, Kirk Cousins and Schaub all playing well under his watch. Shanahan's ability to adapt his system to suit the strengths of his quarterbacks could help Bortles quickly find a groove as a rookie playmaker. Whether it involves shotgun zone-read concepts or features a mix of traditional zone runs and bootleg pass combinations, Shanahan will craft a scheme that should put Bortles in a situation to succeed immediately, even as the youngster continues to grow. With receiver Josh Gordon and tight end Jordan Cameron emerging as difference makers on the perimeter for the Browns in 2013, a Shanahan-Bortles pairing could produce fireworks. Coach Dennis Allen must win big to keep his job, and if the Raiders are to have any chance of competing in the AFC West, they desperately need to find a franchise quarterback. While Bortles is a work in progress, he certainly possesses the key attributes coaches and scouts covet at the position; from his imposing physical dimensions to his solid football intelligence and athleticism, Bortles is the new prototypical NFL signal-caller. In Oakland, a quarterback with such skills could help rejuvenate an organization that has not reached the postseason in over a decade. Of course, Bortles would not immediately transform the Raiders into playoff contenders, but his presence would go a long way toward helping the team regain respectability in the AFC. The perpetual big-game failures of Tony Romo have Cowboys fans ready to move on from the three-time Pro Bowler. Owner Jerry Jones has insisted Romo will continue to be the face of the franchise in the short term, but the back injury (and subsequent surgery) that prematurely ended his 2013 campaign suggests the end might be near for the veteran. With that in mind, it could be time for the Cowboys to invest in a young, promising quarterback who could take over down the road. Bortles is the ideal candidate to fill such a role. While he's not quite ready to start right away, he does have attributes that could make him a star one day. Given a year or two to develop under the watchful eyes of Cowboys coach Jason Garrett and play-caller Scott Linehan, Bortles could be the guy to bring the Lombardi Trophy back to the big D.
Coach Bruce Arians quickly rebuilt the Cardinals into contenders last season with veteran quarterback Carson Palmer at the controls. Of course, while Palmer provided stability at the position, the team's long-term success could be tied to the development of a young, franchise signal-caller. Based on Arians' stellar track record for grooming quarterbacks, it appears Bortles would be an ideal fit; his size, arm talent and athleticism are nearly identical to two former Arians charges in Roethlisberger and Andrew Luck. More importantly, Bortles is capable of playing the game both from the pocket and on the perimeter. With Arians adept at crafting quarterback-friendly offensive systems, the Cardinals could build an explosive attack around Bortles.